A team of biologists from Penn State University has discovered 24 new species of lizards known as skinks, all from islands in the Caribbean. 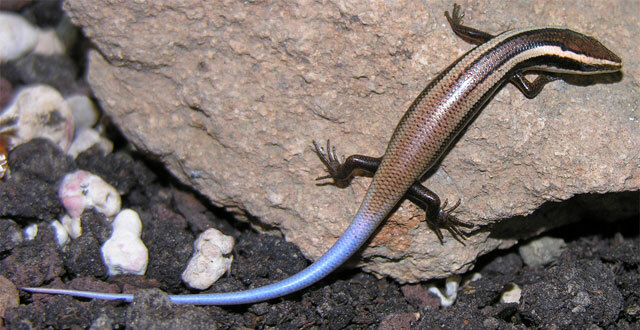 The newly discovered skinks are reported today in a 245-page article in the journal Zootaxa. About 130 species of reptiles from all over the world are added to the global species count each year in dozens of scientific articles. However, not since the 1800s have more than 20 reptile species been added at one time. Primarily through examination of museum specimens, the team identified a total of 39 species of skinks from the Caribbean islands, including 6 species currently recognized, and another 9 named long ago but considered invalid until now. These New World skinks, which arrived in the Americas about 18 million years ago from Africa by floating on mats of vegetation, are unique among lizards in that they produce a human-like placenta, which is an organ that directly connects the growing offspring to the maternal tissues that provide nutrients, Prof. Hedges also explained. “While there are other lizards that give live birth, only a fraction of the lizards known as skinks make a placenta and gestate offspring for up to one year,” Prof. Hedges said. He also speculated that the lengthy gestational period may have given predators a competitive edge over skinks, since pregnant females are slower and more vulnerable. The researchers note that about half of the newly found skinks already may be extinct or close to extinction. The loss of skink species can be attributed primarily to predation by the mongoose – an invasive predatory mammal that was introduced by farmers to control rats in sugarcane fields during the late nineteenth century. This newly discovered skink fauna will increase dramatically the number of reptiles categorized as critically endangered by the International Union for Conservation of Nature in their Red List of Threatened Species. WASHINGTON: Half of the 24 new lizard species known as skinks, all discovered on the Caribbean islands, may be close to extinction and the other half are also under threat. Researchers led by Blair Hedges, professor of biology at Penn State University, attributed their loss to the mongoose, a predatory mammal introduced by farmers to control rats in sugarcane fields during the late 19th century. "The mongoose is the predator we believe is responsible for many of the species' close-to-extinction status in the Caribbean," said Hedges, the journal Zootaxa reports. "Our data show that the mongoose, which was introduced from India in 1872 and spread around the islands over the next three decades, has nearly exterminated this entire reptile fauna, which had gone largely unnoticed by scientists and conservationists until now," said Hedges, according to a Penn statement. About 130 species of reptiles are added to the global species count each year in dozens. However, not since the 1800s have more than 20 reptile species been added at one time. Primarily through examination of museum specimens, the team identified a total of 39 species of skinks from the Caribbean islands, including six species currently recognized, and another nine named long ago but considered invalid until now. "We were completely surprised to find what amounts to a new fauna, with co-occurring species and different ecological types," Hedges said. He added that some of the new species are six times larger in body size than other species in the new fauna. Hedges also explained that these New World skinks, which arrived in the Americas about 18 million years ago from Africa by floating on mats of vegetation, are unique among lizards in that they produce a human-like placenta, which is an organ that directly connects the growing offspring to the maternal tissues that provide nutrients. "While there are other lizards that give live birth, only a fraction of the lizards known as skinks make a placenta and gestate offspring for up to one year," Hedges said. He also speculated that the lengthy gestational period may have given predators a competitive edge over skinks, since pregnant females are slower and more vulnerable.